The spring 2013 Martin Olav Sabo Symposium will feature Minnesota public figures who will model civil dialogue in a discussion on the relationship between government, school districts, and the communities they serve. Augsburg College will host "Funding Minnesota's Future: State Government and its Partnership with School Districts and Communities," the 10th Sabo Symposium, from 4 to 5:30 p.m., March 13, in Hoversten Chapel. The event will feature Myron Frans, the Minnesota Commissioner of Revenue. 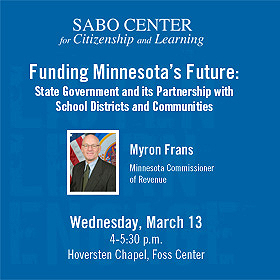 "Frans will be speaking on the real implications Minnesota schools and communities will see relative to Governor Dayton's proposed budget," said Garry Hesser, professor and Sabo chair for citizenship and learning. A bipartisan conversation will follow the presentation by Frans, and two respondents will discuss their perspectives. Alexandria Mayor Sara Carlson will address the state-city relationship. The second respondent, Peggy Ingison, will talk about the state-school district relationship. Ingison is the former chief financial officer of Minneapolis Public Schools, and she "can respond informatively as to what action is needed by schools depending on the size and type of state budget put forward," according to Hesser. The conversation between Frans, Carlson, and Ingison will be moderated by Tom Berg, author of Minnesota's Miracle: Learning from the Government that Worked, and Martin Olav Sabo '59, Minnesota's Fifth Congressional District representative in the U.S. House for 28 years and Sabo Center for Citizenship and Learning namesake. The Sabo Center for Citizenship and Learning is an important contributor to Augsburg's mission to educate informed citizens. The Sabo Center was established in 2009 and since has connected the College to the greater community. The Sabo Center is a hub for public outreach with Campus Kitchen, the Center for Democracy and Citizenship, Bonner Leaders Program, Minnesota Campus Compact, Minnesota Urban Debate League, and other initiatives that stimulate and reinforce the role of higher education in promoting active citizenship. "We want Augsburg students to engage in public policy issues and consider how elected officials and public servants play a critical role in that process," Hesser said. "Our three panelists at the Sabo Symposium are exemplary people who have devoted much of their professional careers to public service." The Sabo Symposium is co-sponsored by: the Sabo Center for Citizenship and Learning, Environmental Studies Department, Economics Department, Political Science Department, Social Work Department, Sociology Department, Business Department, Metro-Urban Studies Department, and the Master of Arts in Leadership Program.